Yes, that’s right — we fertilize our fields with water straight from the sea. In this photo you can see the large container we put on the back of our small truck and the men use a bilge pump out at the coast to pump sea water into it. 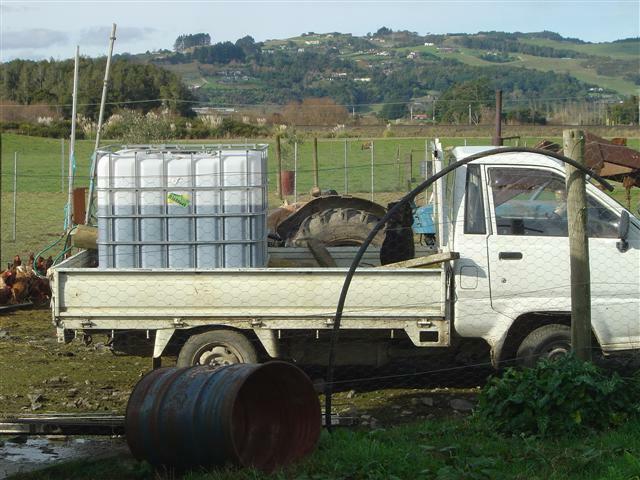 The photo also shows the booms and the tractor on the other side of the truck that we use to spray the saltwater onto the fields. Garden and pasture both benefit. If you have a small garden then a watering can would be fine. In fact that is how we started. It is applied at approximately the rate of one litre to one square metre. When you think of it, it makes a lot of sense to put back on the land what the rain has washed off. What is more it is putting fertilizer there with many trace elements in a proportion that would cost a lot if it was done artificially. So why don’t you try it, and let’s hear back from you.